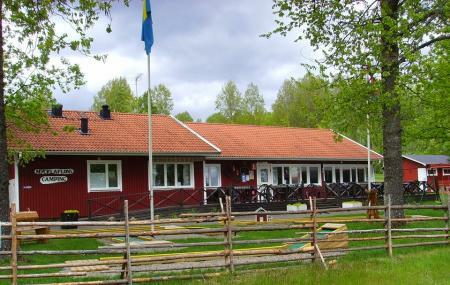 Mycklaflons Camping is in southern Sweden. This part of the country is well known for its warm and flourishing summers, and thus, this camping ground is flooded during the peak season. This region is filled with the best of the natural resources. With ample mountains and hillocks, streams and rivers, and fields and forests, it is the best destination to connect with nature as well as with yourself. Lake Mycklaflons houses the camping sites on its shore, and also provides travelers with fresh water and soothing views. Mycklaflons Camping has 40 tent pitches, with 25 electrical connections and 4 well-equipped campsites. Plan a nice long weekend here, and enjoy the fresh breath of air in nature’s lap. To personalise your visit to the city, you can use an all-inclusive Berghemmet trip planner for the same that will give detailed information about visiting the city. Oomph up your visit by adding the best hotels in Berghemmet like Movnta Camping and RegnbÃÃÃ‚ƒÂ¥gsdalen Cafe & Guesthouse. If you want to add the visit to Mycklaflons Camping in your trip, you can choose from the variety of Berghemmet vacation packages that can be designed to suit your preferences. These packages also cover your major concern of how to reach Berghemmet. Love this? Explore the entire list of places to visit in Berghemmet before you plan your trip. Fancy a good night's sleep after a tiring day? Check out where to stay in Berghemmet and book an accommodation of your choice. Its a nice small camping with beautiful nature and a nice lake where you can swim, there is a kind of restaurant at the enterence where you can eat something simple. There is not much to do with the kids. The reason to come here is to relax and enjoy nature. Very friendly staff and excellent food. The facilities are simple but well functional. Hot water I shower starts immediately when you put in the coin and can not be shut off so be prepared. Location is great and it is quiet. No party people. Very nice camping ground (small but fine. good mix between being close to nature and still enjoy some luxury. as we are used to off-site nature camping without electricity, we liked this place as it offers the main benefits of modern day (warm water, electricity, wifi,...) surrounded by a forrest and a nice sand beach. the camping site layout exists basically one mayour camping "field" with several trees, sourrounded by a forrest. the water is quite clear, the best i have seen so far in sweden. the sanitary and other technical equipment is a bit older but clean and maintained regulary. the price is with 240skr per day really ok (caravan). only drawback is the wifi coverage. for better reception you need to be closer to the main buildings. as it was really sunny, we preferred the places nr 7 - 10, with some trees around and the forrest at your back. Bra bad. Inte så gött käk.